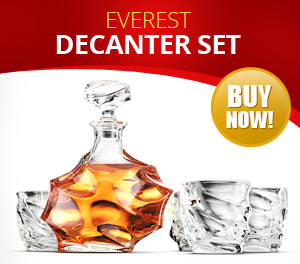 Each Ashcroft decanter starts life as a single tube of high-grade Borosilicate glass. Unlike crystal decanters which by definition must contain at least 20% lead, Borosilicate glass is 100% lead free. Heated over the hottest part of a naked flame, each tube is carefully expanded using human breath and the careful eye of a master glassblower. Slowly and steadily, the tube expands and is shaped into the beautifully crafted vessel you see here in the photos. On average, each decanter takes several hours to craft and set, with only the very best decanters making it into one of our maroon boxes, ready for delivery to you, our valued customer.